Gamelan Laras Tentrem was originally founded as the Boston Village Gamelan in 1979 by Sam Quigley, a graduate of Wesleyan University. The ensemble had the distinction of being the first community gamelan group in the United States dedicated to the performance of traditional Javanese music. Starting with a few imported instruments, the group assembled its own homemade gamelan slendro out of steel, brass, aluminum and various woods. The ensemble has performed regularly throughout New England and, at the invitation of the Indonesian government, at EXPO '86 at their pavilion in Vancouver, Canada. Upon his return from two extended periods in Indonesia, Barry Drummond joined the group in 1992 as its artistic director. Since then, using a gamelan lengkap made by Tentrem Sarwanto, the ensemble has grown tremendously in its musical capabilities. Most notably, the ensemble shared the stage with the Chicago Symphony Orchestra in their East Meets West concert (February 1996). Gamelan Laras Tentrem's focus is the traditional repertoire of Surakarta and Central Java. The gamelan on which we play was forged by Tentrem Sarwanto, the most renowned living Javanese gongsmith. We are honored that Mr. Tentrem, in an unusual display of close friendship and pride of work, included his name when he named the gamelan. Rinengga Sih Tentrem is both a signature ("well-made by Tentrem’s feeling of friendship") and a title “Enhanced by Serenity” (for those who hear the gamelan). 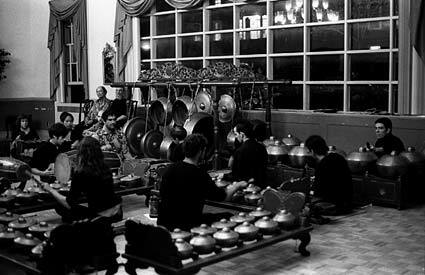 Gamelan Laras Tentrem has been mentored by prominent Javanese musicians including the late K.R.M.T Bojrodiningrat (R.M. Soekanto Soedarsono), I.M. Harjito, Sumarsam, Wakidi Hardjo Martoyo and Djoko Walujo. This year we are pleased to welcome our guest director, Darsono Hadiraharjo. Born into a family of dhalang and musicians that trace their ancestry back several generations, he is botha graduate and teacher at ISI Solo, a member of the Mangkunegaran court gamelan, and is recognized as being one of the leading musicians of his generation. Musical ensembles consisting primarily of gongs and metallophones are found throughout much of Southeast Asia and the Indonesian archipelago. In Central Java, in the vicinity of the court cities of Surakarta (Solo) and Yogykarta (Yogya), a genre of music developed for these gamelan (the term for these ensembles on the islands of Java and Bali) that was essential to traditional culture. The composers of pieces predating Indonesian independence (1945) are largely unknown. Rather, court musicians customarily attributed pieces to their royal patrons. Since Indonesian independence, the decline of the Central Javanese courts’ influence and the increasing Westernization of popular culture have contributed to a lessening of the importance of many of the traditional Javanese arts. However, gamelan music still thrives as an integral part of life-cycle rituals, as ceremonial, art and entertainment music, and as accompaniment for dance and theatrical performance. This is due in large part to the ingenuity of musicians in creating new arrangements of the older repertoire, thus adapting to changing times without compromising either their own or their music’s integrity. 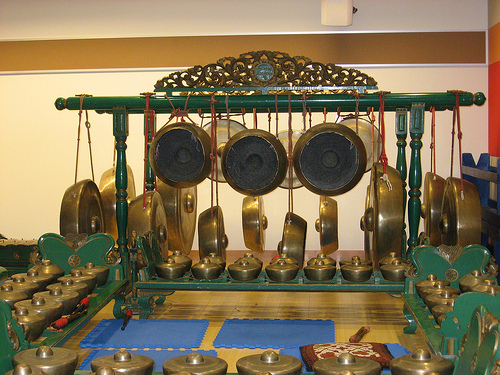 A Javanese gamelan consists of two tuning systems: 5-tone slï¿½ndro and 7-tone pï¿½log. Generally speaking, Javanese performance tends to progress from relatively serene and stately to more animated and light melodies, both within an individual suite as well as during the course of an entire performance. Your invitation to become involved! Gamelan Laras Tentrem rehearsals are open to the public [directions]. We are currently accepting new members and are available for performances. For more information contact Barry Drummond, Artistic Director, at barry.drummond@tufts.edu. Javanese Gamelan Ensemble for middle and high school students is also offered as part of the Tufts University Community Music Programs. For more information please click here. 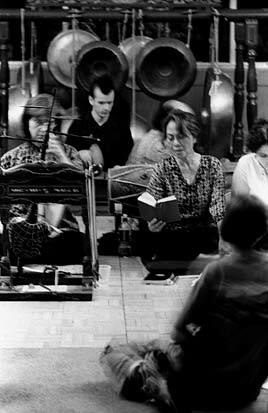 The Boston Village Gamelan is a 501 (c)(3) tax-exempt, not for profit organization. We rely on dues from our performing members along with additional donations for our operations, including upkeep of the instruments, insurance, and fees for guest artists. Our concerts at Tufts University are offered free of charge to all. We have a mailing list to announce our concerts. You can subscribe to it via the web. Javanese gamelan notation in PDF format.